There is something here that is astonishing to many of us, and I am not talking about the incredible load of fish that St. Peter and company were given. 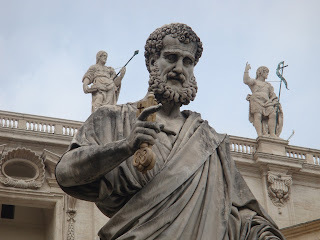 It is St. Peter’s reaction, and the Lord’s response to him. “Depart from me for I am a sinful man.” Strange words to have come from the lips of St Peter, the Prince of the Apostles and our first Pope. Strange indeed, to desire him to depart, without whom the stupendous catch of fish would have been impossible. An astute businessman would have held on to the bigger catch, Jesus the Miracle Worker. Why kill the goose that lays golden eggs? It would even seem that St Peter was attempting to perform an exorcism of Jesus. It would be poetic justice that Jesus would later return the favour. Admittedly, humility and the humbling of oneself is out of fashion in today’s world and seems unappealing to most of us. The consequences of such an attitude may give us pause. Humbling ourselves could be costly in the workplace, in the community, or in other ways. It may even seem suicidal to take blame and to admit our faults especially when everyone else seems to be waiting to get ahead through self-aggrandisement and by putting the blame on others. Nevertheless, for us Christians, it is never an option. If we wish to follow Christ, we must choose the path of humility. Christ teaches us that at the heart of humility is the recognition of our place before God and others. If pride is an exalted sense of who we are in relation to God and others, humility is having a realistic sense of who we are before God and others. We must not think too highly, or too lowly, of ourselves. Rather, we must be honest and realistic about who and what we are. The desire to lift up and exalt ourselves beyond our place as God’s creature lies at the heart of pride. The Fall took place when Adam’s and Eve’s desire to become Godlike grew stronger. Humility is not assuming too much neither is it being too unassuming as to deny or triviliase our God given gifts. A desert Father, St Gregory of Sinai, once taught that “True humility does not say humble words, nor does it assume humble looks, it does not force oneself either to think humbly of oneself, or to abuse oneself in self-belittlement. Although all such things are the beginning, the manifestations and the various aspects of humility, humility itself is grace, given from above. There are two kinds of humility, as the holy fathers teach: to deem oneself the lowest of all beings and to ascribe to God all one's good actions.” When we belittle our gifts we may end dishonouring God who had granted those gifts to us. St Ignatius of Loyola, the founder of the Society of Jesus, in his Spiritual Exercises, encouraged retreatants and directees to meditate on the Three Modes of Humility so that we might be properly disposed to receive God’s will with openness and obedience. The Three Modes of Humility are really three attitudes toward the service of God and the use of created things. It is important to note that attention given to the Three Modes of Humility should be more than a simple meditation; it should be something we chew on throughout the day, something which is gradually translated from thought to will and finally to action. The first degree of humility is humility for the sake of salvation. This is the base line minimum humility. It is necessary to turn away from the seductive power of sin and toward a life following God. The first step towards holiness and humility is when the penitent sinner acknowledges his own faults and sin. Notice how the proud often claim that they have no sin. There is no need to speak of the other two modes or degrees, if this first threshold cannot be breached. The second mode or degree is to observe a detached life, or “holy indifference.” The second mode calls us to a freedom from our preferences, habits, and anything else that we consider to be ours so that we may more readily follow Christ just as Christ followed the will of God the Father above all else. We are often guilty of self-deception, which is we often choose to supplant the will of God for our own, when our own ambitions and heart-stirrings are deemed to be promptings of God. We must not allow the devil to even tempt us with apparently good things and by choosing these things, we abandon God’s plan. The final and most pure degree of humility is the humility for the Love of the Poor Christ. Notice that the first two degrees or modes correspond with the first part of Jesus’ inaugural proclamation of the inbreaking of the Kingdom of God, that is to “repent,” to turn away not only from sin, but also to turn away from every attachment. The third degree provides us with the goal of discipleship, it is the essence of “believing.” And so the third degree propels us to live a very humble style of life similar to Christ’s for no other reason than a sincere and profound love for the poor Christ. Rather than concerning itself first with one’s own well-being or with doing the right thing, this degree is centred around nothing more than pure love for Jesus. Truly, humility is our greatest friend. It increases our hunger for God’s word and opens our hearts to his Spirit. It leads to intimacy with God, who knows the proud from afar, but dwells with him “who is of a contrite and lowly spirit” (Isa. 57:15). It imparts the aroma of Christ to all whom we encounter. It is a sign of greatness in the kingdom of God (Luke 22:24–27). But developing the identity, attitude, and conduct of a humble servant does not happen overnight. It is rather like peeling an onion: you cut away one layer only to find another beneath it. But it does happen. As we forsake pride and seek to humble ourselves by daily deliberate choices in dependence on the Holy Spirit, humility grows in our souls. Humility is not a virtue that can be acquired in a few months: it is the work of a lifetime, always remembering that grace makes up for what will always be lacking in us. It is such amazing grace that can choose and call a sinner like Peter and make him a Prince among the Apostles and Fisher of Men, and it is such grace that will be our salvation.